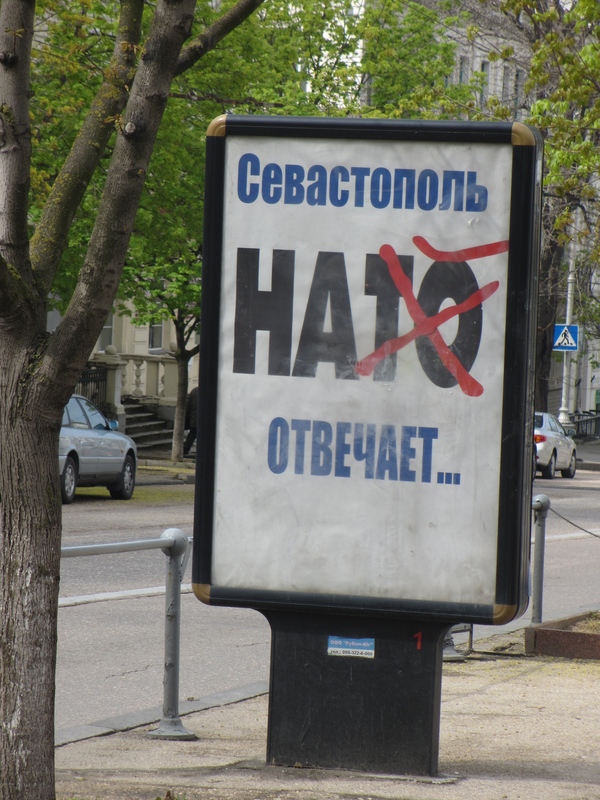 One month ago today, on the 16th March 2014, there was a referendum in Crimea to decide whether it would remain part of Ukraine or ask to part of the Russian Federation. 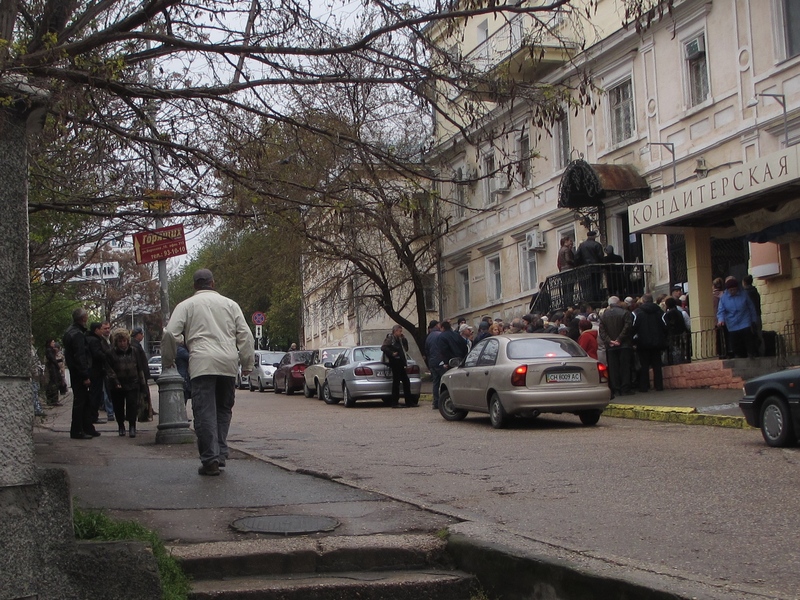 I’ve blogged extensively about the whole process of what has been happening in Sevastopol, and will continue to do so for as long as there seems to be something to say. As I write this, Ukraine has launched ‘anti-terrorist’ action against protestors in the Donetsk region. In the last couple of hours, Putin has warned that Ukraine is ‘on the brink of civil war‘. Some suggest that Russia have forced Ukraine’s hand by sending people into the area to incite violence and will use this as an excuse to send in their own troops. I have no idea if this is true or not, or how comparable this is to what happened in Crimea (as has been discussed), but I don’t believe the Ukrainian government is entirely blameless either. As I’ve said before, their unwillingness to accept Russian as an official language or to seek closer relationships with those in the east has inevitably alienated people. There have been attempts in the last week or so to remedy this, but I feel it’s too little, too late. My worries about getting back to Sevastopol were completely unfounded. My train journey from Kiev to Sevastopol was uneventful. 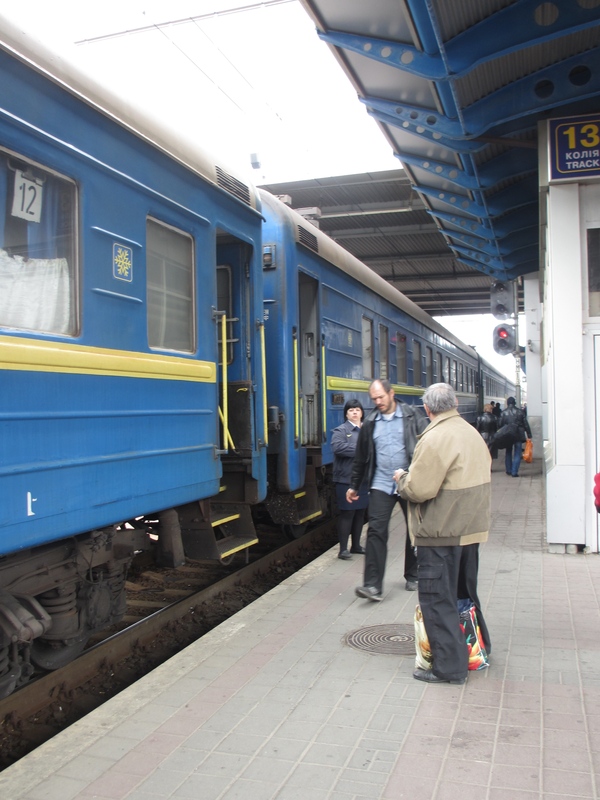 The only difference between the journey out and the journey in was one extra passport check: on the way out only the Ukrainian border guards checked, on the way in both Ukrainians and Russians checked, about an hour apart. No comment was made about my Ukrainian visa, and I was asked no questions at all, unlike when I flew into Simferopol at Christmas. The train was as busy as one might expect for a mid-week one, and the BBC video about people leaving Crimea on the train did not reflect the fact that people are still travelling in both directions. The man I shared my compartment with was from Kiev, but works in Dzhankoy in Crimea. The train still seems to be a viable travel option, for now at least. In the week before I went to the UK, and the week since I came back, I’ve seen more military in Sevastopol than I had done for the previous six weeks. Yesterday seven or eight military trucks drove past me, a sight which was fairly common until the start of February when they all disappeared. On Monday I saw 17 buses (helpfully numbered) drive past in convoy, all full of military personnel – I guess there must have been over 400 of them. I assume that means they’ve all come back to their bases. It feels like things are largely back to normal here in terms of military presence. I’m a big fan of the new GMT +4 time zone, although I was assured it’s not actually new and is what Crimea (and all of Ukraine?) used to be on until 1998. Now I’m being woken by the sun at 07:00 instead of 05:00, and it’s still light when I finish work at 20:00, and for about an hour afterwards, instead of being dark at 18:00. It seems to make a lot more sense, although whether that will be true all year round with no change for winter remains to be seen. For two weeks, no post arrived at the school. I was told that the Ukrainian postal services were no longer operating, and when I got something yesterday I don’t know who it was delivered by. I want to go to the post office, but I’ll be waiting for a while until it’s clearer whether the postal system is still functioning or not. It’s not clear what will happen to any backlog of post that might build up in the meantime. Another thing that Ukraine have stopped providing is support to pensioners. The money now all comes from Russia. Because the exchange rate that pensioners are paid in is different to the one on the street, they apparently get the money in roubles, then change the money into hryvnia and end up with more to spend! 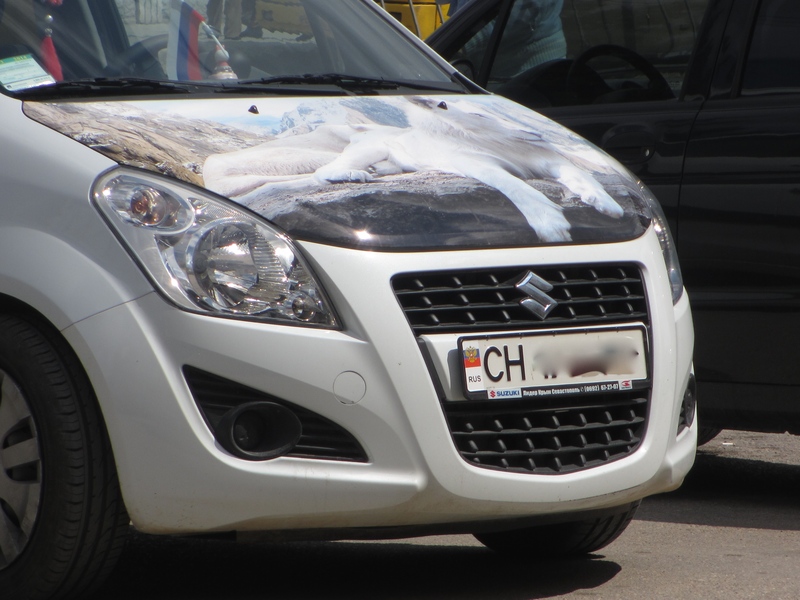 The picture above shows a fairly typical sight now – stickers are on sale all over the city so people can change the country on their registration plates. I estimate about 15-20% of cars in Sevastopol have some form of Russian flag on the number plate now, and over 50% of them have Russian flags in or on them somewhere, like the one on the dashboard here. A lot of the buses have small flags attached to their wing mirrors. 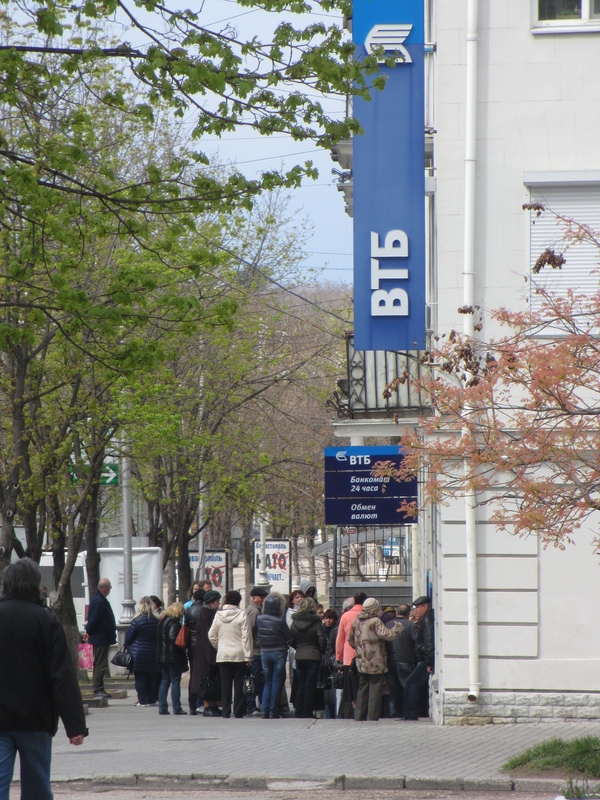 I don’t know how many different places people can go to get a Russian passport, but these people were queuing at one in the centre, and I know this is not unusual. The people on the left-hand side of the street are reading information about what they need to do to get their passport. Apparently while I was in the UK there were big queues at photo studios for people to get their new passport photos, although those seem to have disappeared now. One teen student came to class a bit late because she’d just spent three hours in the queue to submit her documents, but was really excited because that meant she was going to get her Russian passport. The same 16-year-old has the Russian national anthem as her ring tone. Another student has just turned 16, and a couple of weeks ago wasn’t sure what to do about getting her ID, which here is also confusingly called a passport. As far as I know you have two passports – an ID document and one for international travel, although I may be wrong! In Russia you get official ID from the age of 14, but in Ukraine it’s 16. Now she’ll definitely get Russian ID, and her grandma said they would have a special dinner and champagne to celebrate because it proved she was officially an adult. I love this idea! Others are waiting until the rush dies down to get their new passports. Ukrainian passports will still be valid for a while, although as with everything else I have no idea how long for. I’ve seen roubles now, but they’re still not particularly common. I’ve had a couple of coins given to me as examples, but haven’t used them in transactions yet. Some of the coins have the coats of arms of cities across Russia on them, and a friend was excited that Sevastopol would soon be on the coins too. I managed to get money out of the bank again the other day, and was given the option of having it in roubles of hryvnia, but decided on the latter as I think it’s still more useful. However, the exchange rate is going up against the pound/euro/dollar in both currencies, and I’ve exchanged some of my pay into pounds to try and protect my money a bit. I know this is the kind of thing that doesn’t help, but I need to make sure the money doesn’t all disappear. Tablets which I currently have to buy every 25 days have gone up drastically in price, from 642UAH last time I bought them to 802UAH a few days ago. I’m lucky because I have a comfortable salary, and I don’t know how people manage who aren’t – they must have to go without, which will ultimately add more strain to the system. The money that Russia has promised to spend on Crimea and Sevastopol is already worrying them, and could be adversely affecting the GDP. I wonder whether it will ever come through? Queues are still quite normal outside banks. I think this one was caused because there were rumours that roubles had arrived there, although I’m not really sure. Banks are not doing international transfers, and some Ukrainian banks have stopped working here completely. Large Russian banks don’t seem to want to open branches here in case they are hit by sanctions, which paves the way for smaller banks. However, the smaller banks are also having trouble making international transfers which is causing the school some problems. This is the area where uncertainty seems to be greatest: the banks don’t know if they will be there from one day to the next, making it very difficult to plan for the future. The problems with the banks also don’t help with paying taxes – it’s not clear how these transactions can be made. I know people who are still thinking about leaving Crimea, and I know others who were going to leave but have now decided to stay. Those who are staying are still pretty positive about the whole change to being Russian, although the uncertainty, particularly about money, can be wearing. People are moving around a lot more, and I feel safe enough to hopefully start exploring Crimea a bit more from this weekend. On a final note, the signs below were all along one of the main streets in the centre of the city by the weekend, and today have appeared all along my street. I’ve been told they are quite rude, although Google Translate isn’t very helpful with this. No idea who’s paying for them all, but on the plus side a lot of the referendum ones seem to have disappeared, although unfortunately not the one I can see from my window. I wonder how long these ones will last for?